This week’s Photo Friday will be a little different. Fellow campaigner, Susanna Leonard Hill has started something different on her blog. A theme will be posted every week, so that others can place a photo representing that theme on their own blogs. As she’s a children’s writer, the photos need to be kept in a range appropriate for 0-12 year olds. As this week’s theme is ‘Confusion’, I didn’t have to search far amongst my photo collection. A few years ago, I went to the Mulga Bill Bicycle Festival at Yeoval. This was once the home of famous Australian poet Banjo Patterson, better known for his poem The Man from Snowy River. Somebody obviously went to a lot of effort for the day’s bike ride (you certainly wouldn’t be seeing me doing this). And it certainly can create a bit of havoc when you’re the one driving! Previous Post My Very First Writing Award. Next Post My Sweet Imago – 2nd Campaigner Challenge. Oh, no! Couldn’t work the camera? Of, your husband owes you big time for that! Hi Jen. I know; he’s not going to live that one down! Jack was good about it too – a genuinely nice bloke. Debbie – this is a great one! 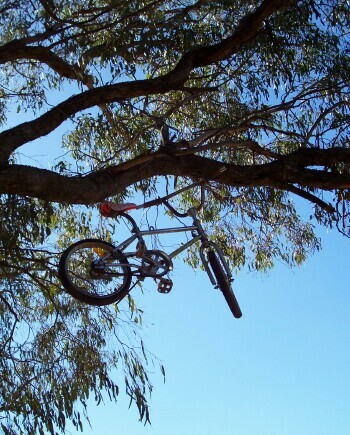 My mind is already turning over story ideas for why a bike would be in a tree (besides your given reason about the Festival.) A bully? A dare? Magic? The possibilities abound! If you get a chance, would you be so kind as to repost your link into today’s post on my blog? I’m sorry I was late getting it up. If you put it there now, people will find it in the right thread and otherwise I’m afraid they might not see it! Hi Susanna. I’m glad you like it – it has plenty of possibilities for a children’s story (now you’ve got me thinking too)! Thanks for letting me know about the new blog post on your site – I’ve just posted the link for you now. I look forward to seeing what other people come up with. LOL! I haven’t seen sneakers over the telephone wires for a while. I’m glad you liked it. Wow, that one’s loaded with possibility! Hi Ruth. I thought this one was perfect – odd, yet full of opportunities for story ideas for kids. I might end up thinking of a few short story ideas myself! Great picture! Reminds me on the snowmobile in the tree near my house lol.